It began more than three decades ago, when Precious Moments creator, Sam Butcher, began drawing the endearing teardrop-eyed children he called "Precious Moments," as gifts for family and friends. Today, his Precious Moments artwork is among the most recognized art in the world, sharing messages of loving, caring and sharing with collectors from around the globe. When you see "the eyes" you know it is a Precious Moments product. It is my belief there are angels all around us. They watch over us and are there ready to assist if we just ask for their help. I’ve felt their presence on several occasions and knowing they are there has brought me comfort. Have you felt your angels by your side? Have you had a feeling you should or should not do something and didn’t know why? It’s likely your angels guiding you along the way. I feel my sweet daughter, Aubrey around me often. I’m delighted to share the news Precious Moments has a very special figurine each one of us should buy for ourselves and for the loved ones in our lives. 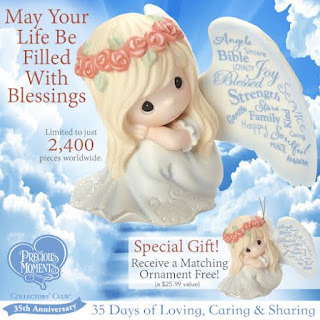 May Your Life Be Filled With Blessings figurine is a new exclusive piece created specially to commemorate the 35th anniversary of the Precious Moments Collectors’ Club. This ethereal porcelain figurine has written on its wings 35 blessings, such as Joy, Family &; Friends, Love, and Hope. If you’ve never purchased a Precious Moments figurine before, then this is one you will absolutely want. If you do have Precious Moments pieces, you must add it to your collection. Having this sweet angel sitting on a shelf or table will be a reminder of all of the blessings we have in our lives. It’s a lovely way to remember to always live in gratitude. Currently the May Your Life Be Filled With Blessings is available exclusively online, and limited to 2,400 pieces worldwide. Beginning on Saturday, June 25th, if you purchase the figurine for a limited time you’ll also receive a matching ornament free. Check her out below, she is too cute! This is something you cannot pass up! Precious Moments is also giving away to one of you lucky readers the beautiful May Your Life Be Filled With Blessings figurine and ornament! Double your chances by entering the Precious Moments Facebook page and entering to win one there too! The sponsor will be shipping the prize direct. Please allow several weeks for prize shipment to occur, as I am not the only blogger featuring this product. Giveaway is open to the USA and CANADA!! Giveaway ends two weeks from now on July 8, 2016 at 11:59PM CST. Enter below, good luck to all. This new figurine reminds me of those people on earth whom I also recognize as my angels. Our angels can be a best friend, a relative, or even someone we’ve never met but who suddenly has a positive impact on our lives. Be sure to visit the Precious Moments website to see the other beautiful products that they have to offer. There is something for everybody! You can also visit their social channels below. I'd be keeping them for myself! Thanks for the chance! I am a Precious Moment collector, so I would keep it for myself. I'm keeping these.....it's nostalgic for me! I would share this with my baby sister. I'd keep the ornament and gift her the figurine.